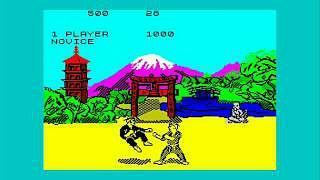 Okay, so this wasn't the first martial arts fighting game of the 1980's, but it was far better than both Karate Champ and Kung Fu Master which were released in 1984. Featuring gorgeous character animation and digitized speech, combined with a wide variety of moves (very realistic they were, too) this was almost the perfect beat-em-up in the mid eighties. 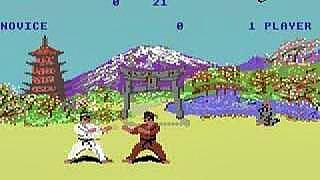 In fact, this game set the standard for this type of game, and surely influenced many games that followed such as International Karate. The game was first developed for the C64 (you can see this version by Mebourne House in the video clip above) and then ported to other systems including the Amstrad CPC, Spectrum, BBC Micro, Acorn Electron and Commodore 16. Karate champion Jeoffrey Thompson was signed to promote the game, although he wasn't well-known enough to have his name used in the title! A bonus round where the player is charged by a bull never made it to earlier C64 versions or the Spectrum version. This video compares the different 8-bit versions of Way of the Exploding Fist, with versions from the BBC Micro, Amstrad CPC, ZX Spectrum and Commodore 64. The C64 version appears to be the best quality version, but they did a surprisingly good job with the Spectrum version (nice animation) considering the limited graphics capablilities. I Quite like the BBC Micro version, although visually I preferred the Speccie and C64 versions. As per usual, the Amstrad version requires sunglasses (graphically rather bright) and is without the smooth animation and soundtrack as seen in the C64 version - put simply, it lacks finesse.